Israeli Prime Minister Benjamin Netanyahu speaks at the Cabinet meeting on Sunday in Jerusalem. Israel's plans to build in mainly Arab East Jerusalem have strained ties with U.S.
Jerusalem (CNN) -- Israel has no intention of backing down in its argument with the United States over Israeli plans to build 1,600 apartments on disputed land in largely Arab East Jerusalem, Prime Minister Benjamin Netanyahu said Sunday. "Our policy regarding Jerusalem is the same as it was over the past 42 years. 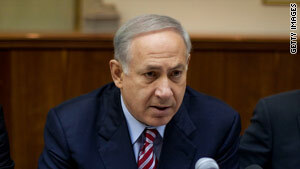 We have made it clear to the Americans that for us, building there is just like building in Tel Aviv," Netanyahu said. Israel captured the land in question in the spring of 1967, nearly 43 years ago. Netanyahu plans to leave for the United States on Sunday night and speak to the influential lobbying group the American Israel Public Affairs Committee on Monday. It is not clear if Netanyahu will meet President Obama on the trip. Netanyahu also said Israel favors direct talks with the Palestinians. "We can raise any issue for negotiation and have made it clear we can do so better through direct talks. Only if you sit down and speak can you reach a real negotiation," he said. The two sides had agreed to indirect talks shortly before Israel announced that it plans to build some 1,600 housing units in a disputed part of East Jerusalem. The move sparked protests and strained the U.S. relationship with Israel, though U.S. Secretary of State Hillary Clinton has said the relationship is "deep and broad" as well as "strong and enduring." Clinton has said she expects to meet with Netanyahu during his trip to Washington. U.N. Secretary-General Ban Ki-moon said Friday the Middle East Quartet condemns Israel's construction plans. The Quartet comprises the four international entities seeking peace in the region: the United States, Russia, the European Union, and the United Nations. The Quartet's envoy, Tony Blair, said Friday that Israel was offering measures to kick-start the peace process. Blair's comments came after a meeting in Moscow, Russia, of the Quartet, which called for Israel and the Palestinians to have direct negotiations and reach a final settlement within two years. Netanyahu pledged a package of moves to boost confidence and get the peace process back on track, Blair said. Those measures include steps to improve the humanitarian situation in Gaza, Blair said, but he did not specify whether the steps included prisoner releases. Complex negotiations about the proposal are now taking place, said Blair, a former British prime minister. Blair said he is certain that Israel genuinely wants a workable peace deal with the Palestinians, but that it is also important for Palestinians to know they would have a viable independent state. "Arab-Israeli peace and the establishment of a peaceful state of Palestine in the West Bank and Gaza is in the fundamental interests of the parties, of all states in the region, and of the international community," U.N. chief Ban said. "In this regard, the Quartet calls on all states to support dialogue between the parties." Chief Palestinian negotiator Saeb Erakat said he welcomed the Quartet's statement and hoped it could be translated into action. "I think it's really more than words," he said, "because this is coming at a time when the international community is at its feet now as regards Israeli settlement activity and Netanyahu is still being defiant. Netanyahu is defying the whole international community now and he's insisting to continue settlement activity, and he's telling the world, 'Look, I'm going to fool you -- I'm not going to announce any tenders anymore, but I am going to continue with settlements.'" But Avigdor Lieberman, the Israeli minister of foreign affairs, indicated resistance to the 24-month plan. "You can't force peace in an artificial way with an unrealistic timetable," he said on a visit Friday to Brussels, Belgium. "Statements like this only distance a true settlement between Israel and the Palestinians." Israel and the Palestinians were supposed to hold indirect "proximity talks" with the Obama administration's special envoy to the Middle East, former U.S. Sen. George Mitchell. But two days after those talks were announced, Israel revealed its plan to build the 1,600 units in East Jerusalem, and that put the entire process on hold. Erakat said it would be "very difficult" to hold any negotiations -- including proximity talks -- unless Israel rescinds its plan to build in East Jerusalem.